Turning a blind eye. 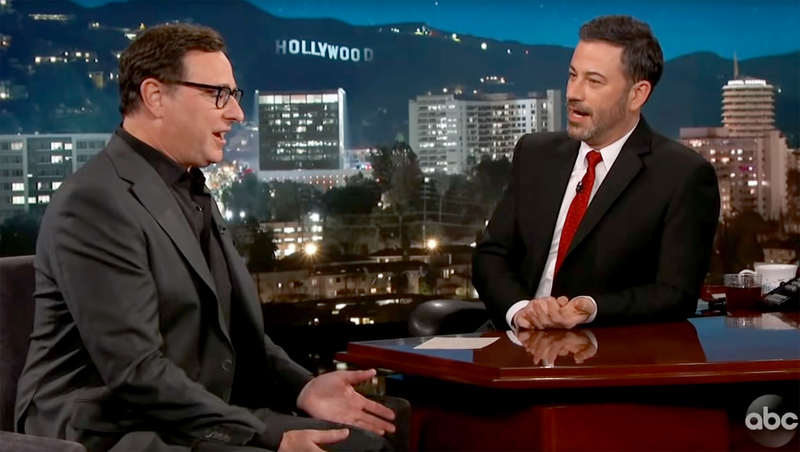 Bob Saget was interviewed by Jimmy Kimmel on Tuesday, March 12, but never addressed his Full House costar Lori Loughlin’s alleged involvement in a nationwide college admissions scam. While Saget spoke about his fellow Fuller House costar Stamos, 55, he kept his lips sealed regarding Loughlin, 54, who was indicted earlier on Tuesday in connection with the academic scheme. The Summerland alum and her husband, Mossimo Giannulli, allegedly “agreed to pay bribes totaling $500,000 in exchange for having their two daughters designated as recruits to the USC crew team — despite the fact that they did not participate in crew — thereby facilitating their admission to USC,” according to court documents obtained by ABC News. The pair’s children — Bella, 20, and Olivia, 19 — both currently attend the University of Southern California. Giannulli, 55, was taken into custody on Tuesday and a warrant for Loughlin’s arrest was issued, but she was out of the country at the time. She is expected to surrender on Wednesday, March 13. Us Weekly confirmed on Tuesday that Huffman was arrested for her alleged involvement in the crime on Tuesday. She was reportedly taken into custody by several armed FBI agents at 6 a.m. and was later brought to a Los Angeles courthouse where she went before a judge. Her husband, William H. Macy — with whom she shares daughters Sofia, 18, and Georgia, 16 — was present for the hearing. The Cake actress was released on $250,000 bond later that evening.